Thought I would open a topic for the hurricane that is heading toward the east coast. Probably should have done this earlier, but I guess I was hoping it would turn away and not be any news at all. Aunt Bonnie evacuated to our house on Monday night as she was in the mandatory evacuation area. We have been watching the changing forecast every day to determine our best action plan and right now we are planning on staying here. We do expect 6-9 inches of rain in the next 2 days and that may create some flooding issues around us as it has in the past. Additionally we expect some pretty good wind gust starting late this evening. I have a generator if we lose power that I can connect to the house and selectively power some of the essentials; like keeping the refrigerator running, fans and lights. We will fill both bath tubs with water later tonight for some extra water. I should be able to power the well pump if we need more and the power is out for an extended time. We are shutting the plant down today. I'll be heading home in about 2 hours and not have to be back at work till Monday morning. Of course that is if the plant has power. I'll get reports from various people all weekend on the status of the plant and power. Anyway we are about as ready as we can be and will be glad when it is over. Sure hope you all are safe. How far are you guys from the projected path? Would be nice if it headed east and dies out. Add: I've been watching https://www.earthcam.com/usa/southcarolina/myrtlebeach/?cam=myrtlebeach_hd and other cams. Glad you let us know your plans. Please keep us updated. William, they are in that cone but not on the coastline. Because the path keeps changing, it’s hard to say. 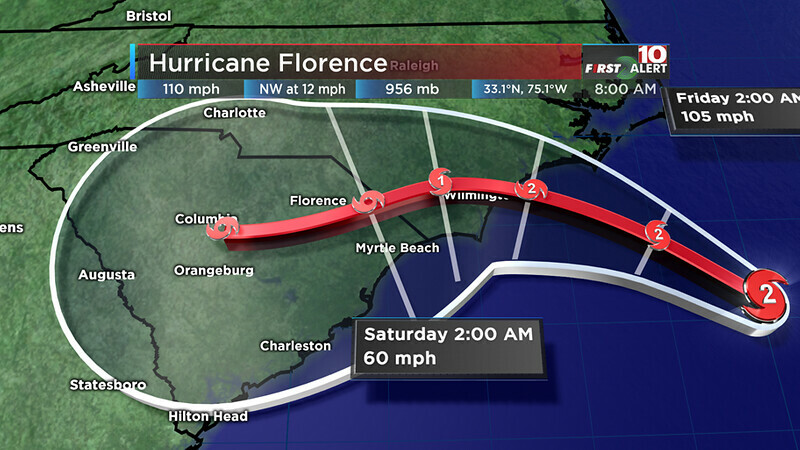 Right now the projected path is about 25 miles north of us. Also it’s downgraded to a tropical storm by the time it gets to us. Still, I’m not looking forward to 50 mph gust or higher. I had to work on my generator this afternoon because it wouldn’t start. I had some old gas in there and it wasn’t level. I got it going though. I’m home now till Monday. We expect to start seeing rain and wind tomorrow afternoon. ...Anyway we are about as ready as we can be and will be glad when it is over. that sounds like us jim. work is closed tomorrow (jumped the gun) and it's a 50/50 split on if they are closing saturday. i'm half hoping. i'm glad you started this. even though i'm not in the cone at all right now, i'm waiting to see, and i know we will get the rain. we always do. Everyone just keep watching and stay on top of things. I'll be praying you all stay safe. Winds have picked up with a few gust. Wind speeds now are about 11mph with average gust at 15.9mph. It's going to get worse. No rain so far. It looks like we might not get the rain totals that were first forecast. It's been all over, kind of like the forecasts have been. Last I heard, if the storm center stays as far north as they are predicting now, we will get 4-6 inches. If it comes south before it turns west, we will get 9-12 inches as the heavy rains are mostly on the north east side of the storm. Here's a link to my weather station if you are interested in what is going on till the power goes out. I missed this yesterday. I'm glad you are on it, Jim. Rain is here and the winds have picked up. Had a 32 mph gust just a bit ago. Aunt Bonnie and Dianna are sitting on the porch smoking and watching the storm. Forecast now says we could get 8-15 inches of rain. I don't mind the rain so much but the wind makes me nervous. Anyway so far so good. We still have power and have all taken a shower so we are good to go for a little while. Hope Sheri and Johnny are making out ok. It's been dark outside all day today. We've had some wind since early this morning then around 4PM it got pitch black and started raining but the rain hasn't been bad and it's lighter now at 7:20 PM than it was earlier today. It looks appropriate for the time out there right now and on one side of the house the sky is sort of clear. The local weather man keeps saying "oh it's coming" but I'm not sure if he's just being dramatic or if we're going to be blown off the map. We have friends who stayed in Myrtle Beach, after being advised not too, but they still have power and say it's not bad at all. We haven't heard from our friends in Wilmington since early this morning when their power went out. TV is showing pictures of Wilmington underwater with dolphins swimming in the street and I'm hoping they got to higher ground. She has a brother and sister and friends living here so there was no reason for her to stay there. Not sure why people do what they do. i'm glad to hear from everyone. all i have heard from outside of here have been fine, but the photos coming out are scary. we will see rain tomorrow, and we got a good bit of wind today, but overall, nothing to write home about. Glad everyone is staying on top of things and checking in while you still can. Makes me feel better anyhow. Raining and raining and raining some more. Wind is coming and going. Steady rain and wind today. We've had about 1.55 inches of rain. Thankfully the wind hasn't been bad. It's been steady but haven't seen the high gusts they were predicting. The storm is definitely moving slow. About 2 mph at last report. That will put it here about 8PM tonight. Hopefully it will be downgraded to a tropical depression by then and the winds won't be bad. We are still on the "good" side of the storm, if there is really one of those. I think of them having a bad side and a worse side. Stay safe everyone. it's a non event for us. rain, breezy (no gales), and while the temps are higher outside officially, without the sun baking us, it feels quite nice. This morning everything is back to normal here. Light drizzle now and again but no wind at all to speak of. We really dodged the bullet this time. At one time they were predicting 70MPH gusts for us and I was really nervous about that. Aunt Bonnie is going home today. It was nice having her here this weekend as it had been some time since she had come visiting. She hadn't seen our new garage. Prayers still going out to those still dealing with the aftermath of Florence in North Carolina. I'm glad for you Jim but it's not back to normal for us yet. Been raining non stop for 24 hours and is still coming down. There's a constant wind, which isn't bad, but the gusts are scary. We definitely are better off than was predicted but it's still awful. I can't stand this constant rain. Thanks for the prayers. Praying is all we can do. sheri, i'm sorry you are having the miserable part. at least you are on a hill. i have friends in wilmington who said they lost power within the first 8 hours of the storm. i don't think they have it back yet, but they were able to recharge their phone. it's not looking good around there, but it's not as bad as it could be or was predicted, so we'll take our blessings where they come. I was watching the Weather Channel most of the day with all the flooding going on in NC. That brings back memories of our big flood a couple of years ago. Justin and Mandy are still getting the rain too and Dianna is seeing all the pics on FB of the flooded roads in Montgomery County. Looking at the map this morning, it appears that Florence has finally moved far enough away that the rain coming in off the Atlantic has stopped cycling in for the most part. Hope things are starting, what could be a long process, to get back to normal in NC. Our neighbors that spend the summer in NYC will be trying to get back here today. We told them last night that there were several spots on I95 that were closed due to water and in some cases there are not safe detours around. Not sure what their plans are but they were leaving early this morning. They had intended on coming back to SC on the 13th but decided to wait out the hurricane. The rain stopped yesterday afternoon and while it's still overcast and windy our yard has dried up some. We're fortunate that we don't have a water standing problem on our land. As far as I can tell, we don't have any trees or big limbs down, which is a miracle. With all the stuff we have in our yard (I moved and turned over some but not all) it looks like only one flower pot was blown onto it's side. It was too heavy for me to move so the wind did it for me. I heard on the news that officials are asking people to not even try to get to Union County for a day or two. Johnny travels this road every day. This poor woman went around barricades and there was too much water. "Late Sunday night, rescuers were searching for a 1-year-old child who had been swept away, WSOC reported, after a car was trapped by floodwaters from Richardson Creek on Pleasant Hill Church Road in Union County. Rescuers said the child's mother was also swept from the car, a WCCB reporter tweeted. She was rescued and taken to the hospital"
If that's the same story I'm thinking of, they found the child, deceased. So sad. Yes the baby's body has been found. Many roads are still flooded and will be until the creeks and lakes recede. Shelley's gang is out of school again tomorrow. Our yard won't take long to clean up.